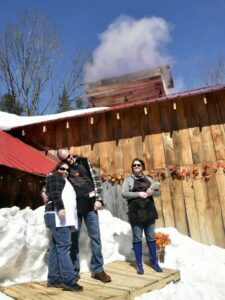 Maple syrup making is a long-standing tradition for Greta Tillson's family, so she said it was only natural to get married at a sugarhouse on Maine Maple Sunday. 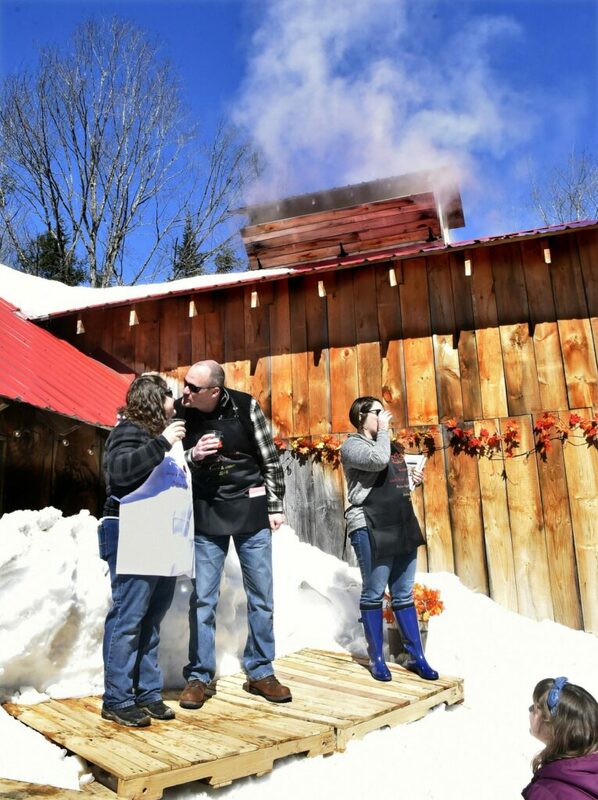 ANSON — Steam billowed out the roof of the sugarhouse at Luce’s Maple Syrup on Sunday as people made their way across a muddy lawn and gathered in front of a large snowbank. Family, friends and strangers held plastic cups of maple mimosas, made of champagne and maple syrup, and parted a path in the mud as Greta Tillson made her way up the snowbank. It was a rare twist on the events of Maine Maple Sunday, a statewide day dedicated to promoting Maine’s maple sugarhouses and inviting the public to visit them. Tillson, wearing flannel and a white apron touting the event, was in minutes about to marry her fiancé Jason Goding in a ceremony outside the maple sugarhouse her family has run for over 100 years. 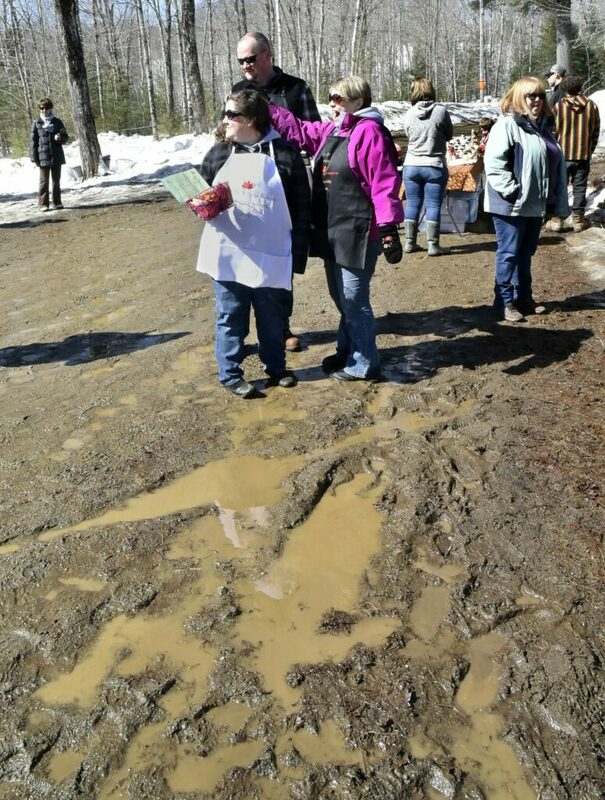 On a wood pallet atop the snowbank, Tillson and Goding joined her sister, Meredith Nunn, who officiated the wedding wearing a similar apron and knee-high mud boots. “Greta and Jason want to thank everyone for coming to celebrate their union and for participating in Maine Maple Sunday,” Nunn said as she welcomed the roughly 130 people gathered outside the sugarhouse. String lights and red and orange maple leaves hung in the background, and the smell of fresh maple syrup wafted through the air. 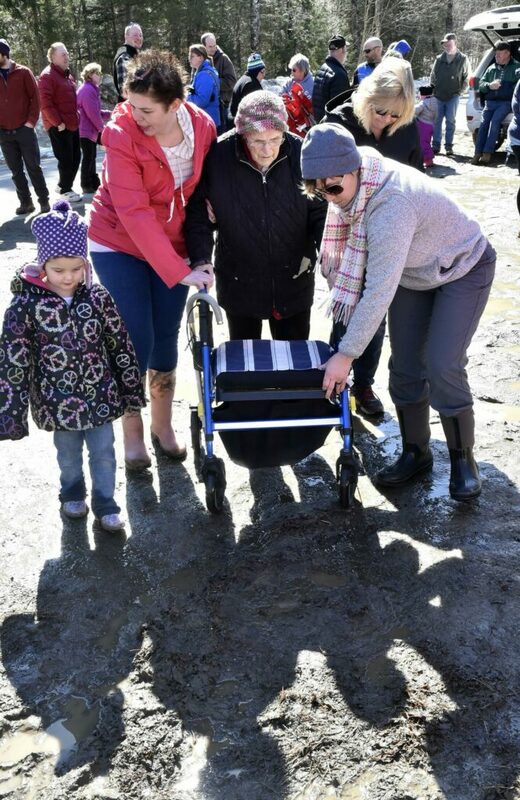 In a ceremony that lasted no more than 20 minutes, the couple exchanged vows and rings that were brought to them by Tillson’s 95-year-old grandmother, Norma Luce, who parked her wheelchair, despite the mud, as close as possible to the snowbank. The couple took a few photos with their daughters, Gabby Goding and Elliotte MacKenzie, and toasted with the maple mimosas before someone from the crowd yelled, “Alright, back to the sausage!” — a reference to the many meat products the Luce family makes and sells. Maple syrup making and Maine Maple Sunday have always been a tradition for Tillson’s maternal family, the Luce family. So her aunt and uncle, Arnold and Elaine Luce, who own Luce’s Maple Syrup and Luce’s Maine Grown Meats said they were not surprised their niece wanted to get married at their sugar shack on Maine Maple Sunday. Arnold Luce is also chair of the Board of Selectmen in Anson. The day, organized by the Maine Maple Syrup Producers Association, is something they have participated in since the early 1980s and that typically their entire family comes to. Arnold’s great-grandfather, Benjamin Luce, started their farm in Anson, though the family’s syrup making traditions date back even further than that to 1795, when Charles Luce, Arnold Luce’s great-great-great grandfather, made his first batch of maple syrup in New Vineyard. The current sugar shack was built by Arnold Luce’s grandfather, Morrill Luce, in 1915. 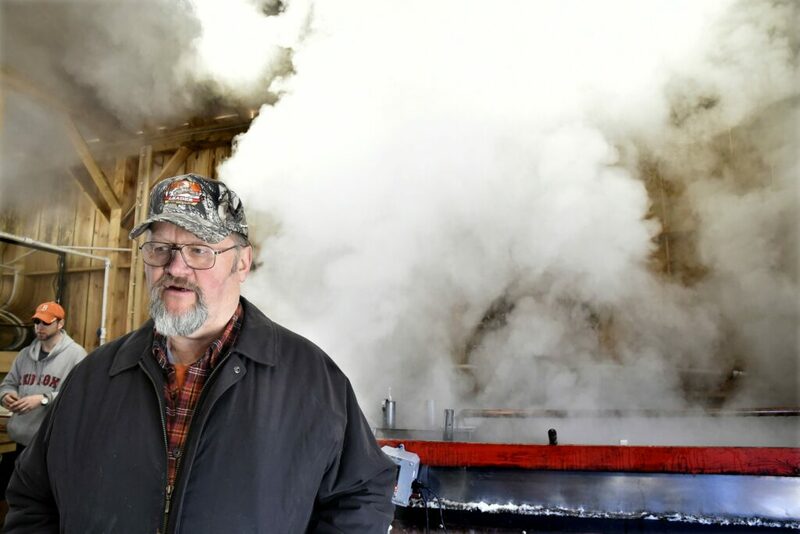 Luce said he produced 1,100 gallons of maple syrup last year, and the family typically welcomes 1,000 to 1,200 people through the doors of the sugar shack on Maine Maple Sunday. Visitors sampled a variety of maple products — maple syrup, maple ice cream and maple bacon donuts, to name a few — as well as the meats Luce produces at his butcher shop. 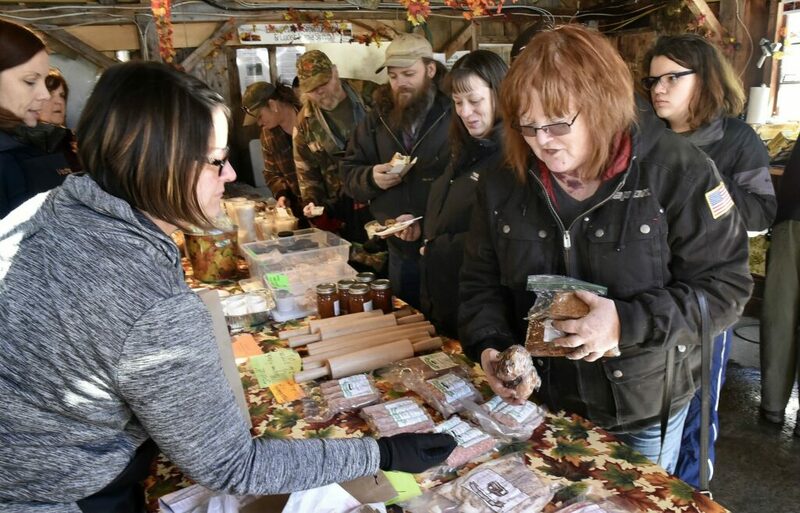 For about the last 10 years, she said she has been cooking sausage from her aunt and uncle’s butcher shop and serving samples to visitors on Maine Maple Sunday. After waking up around 5 a.m. and arriving at the sugar house by 8:15 a.m. to greet visitors who arrived ahead of their official 9 a.m. opening, Tillson said she did most of the things she normally does to help out her family on Maine Maple Sunday. Both she and Goding said they were happy to have a simple ceremony and plan to spend the night in Camden for a honeymoon. He works as a manager for Nouria Energy, and she is a sales representative for Nabisco. In addition to their two daughters from previous relationships, Goding also has a son, Connor Goding. “All the family is here, all the people she wanted to have at her wedding (are here), and she loves coming here,” said Tillson’s mother, Jan Tillson, of Winslow. She also said the wedding was a wonderful surprise for her mother, Norma Luce, who turns 96 this week. Because her birthday usually falls around Maine Maple Sunday, it’s another reason many family members attend the event, she said.